Subscribing to Online Statements? Be Careful, it Could Land in Wrong Hands! In last few years subscribing to online statements (statement delivery via email) has got quite popular, be it your Insurance company, your Mobile Operator, your Bank or many other such companies who offer various kind of services to you. And it is not without a reason, e-statements are good for everyone involved. They are environment friendly, cut costs, time and effort to a large extent. However, there is one serious problem that consumers need to be aware of – Your statements could actually land in someone else’s mailbox. Not only that, the information contained in the statement could harm you if it falls into wrong hands. Here are couple of statements that I receive on regular basis from different companies, which are not mine, but are sent to me. Basically, the telecom company has sent a bill / alert to the subscriber stating that his bill has been generated and the amount involved. It should actually go to a different person, but has landed in my mailbox. I checked the real subscriber using Truecaller app, to whom this number belonged and unsurprisingly it was registered to someone else who has same first name as I had. 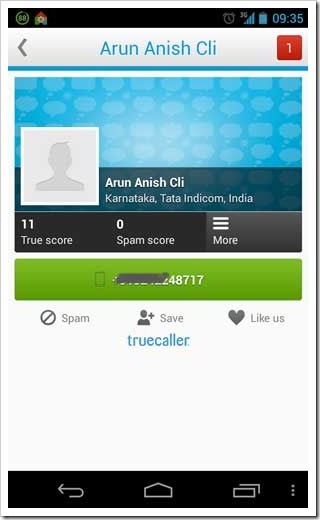 Here is the truecaller screenshot of that subscriber. And if you think it happens in just one-off cases, you are wrong. I know many cases and people who have received statements that don’t belong to them. As far as mobile bills go, it may not be too dangerous, but what happens when online statements are more sensitive? 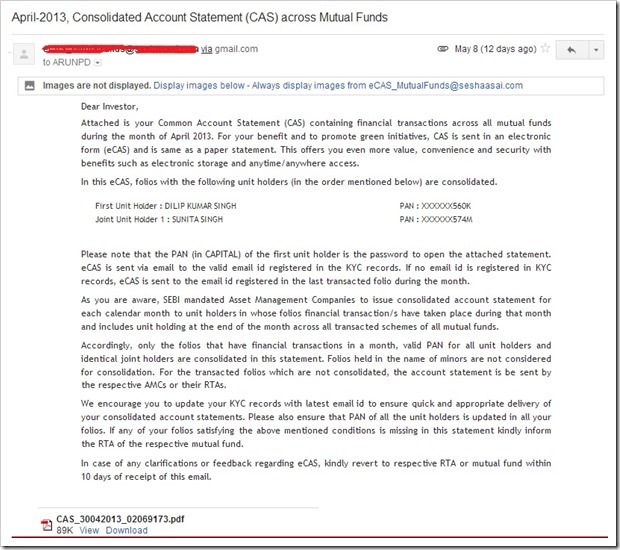 Now, the statement given above is of mutual fund investments and the pdf statement of their investments is attached with the email that was supposed to go to someone else, but has been landing in my mailbox for past couple of months. I have got in touch with people who sent, but looks like the email ID has not been changed. If such kind of emails land in wrong hands, imagine what can happen. What is surprising in the case given above is that my name is not even remotely similar to the person to who whom this email belongs to. What seems to have happened is the insurance company or the agency who are handling these emailers, seems to have goofed up the email IDs. How do you ensure that this does not happen to you? There are 2 things that are important. When you register for such a service, make sure you are very clear when stating your email ID. And most importantly, you will need to confirm it once again once it goes into the system. It is also advisable that you keep a eye on whether you receive your statements at designated intervals. If you don’t get them, there is a high possibility that it may have landed in someone else’s mailbox. A Brief look at Thailand Market and Expansion Opportunities for Indian Startups! 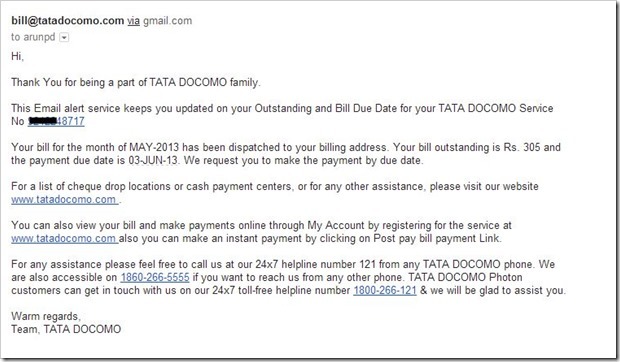 I think TataDocomo is purposefully sending this kind of estatements to unknown email ids to increase their business. I am also receiving such kind of bills every month. Zoomin was great incident where this rohit uses my id, upload his gf photos to gift her printed stuff and gives cell number of gf. It was damn difficult to make his gf understand the issue. Nokia music offers free one year subscription, this dude costed me half year of subscription lost. My one year started when he signed up. @rohit From your comment and many others here as well as on Facebook, Linkedin etc, it is quite clear that this is a wide-spread problem. I am surprised that these large companies do not put processes in place to avoid this. Afterall, if the information is misused, they will also suffer along with consumers. But from the consumers side they need to understand the importance of their data and security. The article is bang on, I have had this issue in the past with Tata Indicom where me & someone from Bangalore had similar 1st & last name & both of us where using the service.. Once accidently mistook the other persons statement as mine & paid the outstanding which I realized the month later when my service was blocked.. I immediately discontinued my service with them after lots of conflicts..
For my Bank account summary, I get a pdf which is password locked with my CRN Number. I dont know if other banks follow it or not. Even then its not completely safe though. I still get the mobile bills of 2 Delhi based customers of Reliance. Have tweeted and complained Reliance Mobile to stop sending me bills but to no avail.